Aster Place was very professional, full of information, and very good. The community is very good. I like the way their housing and buildings were setup, they had it where you would go in, and the kitchen was right there. I like all the appliances that they had, and I also liked the fact that they have a huge dining hall that's fully appointed. They have dishes, napkins, glasses, and anything that you would want or need for a big gathering there. My friend moved into Aster Place memory care. The staff is really friendly and they like to help, but for some reason they are making a lot of mistakes. The grounds are nice and beautiful. It's clean, well kept, and it looks safe. It's a one-story building. She is in one small room with just one queen sized bed, but it's big enough for her. They have a list of activities that they do. When I visit her, they tell me what activities they did during the day. They are treating her right. Even if she has a small problem, they give me a call, and I really appreciate that. Aster Place was recommended to us by people we know in the industry. The place is very clean and very nice. The food is very good. The staff seems to be very good, too. The best way to get to know a community is by scheduling a tour. 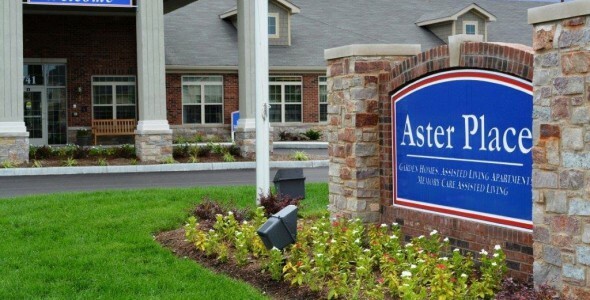 See the facilities, meet the staff and residents, and get a feel first hand what it's like to live at Aster Place Assisted Living. For families in Lafayette, Indiana, they can turn to Aster Place to provide the supportive services and family-like setting that their loved one desires. Our communities are staffed with trained caregivers and healthcare professionals who believe in our philosophy of C.A.R.E. (Compassion, Attentiveness, Relationships and Excellence). This philosophy guides our actions, contributing to the well-being of our residents. Aster Place is one of the many retirement communities owned by American Senior Communities. We created our company to address the challenge of fragmentation of home and health services, and all our communities are designed to serve seniors though an offering of lifestyle choices and integrated amenities and services. The community amenities at Aster Place are many. Residents may be found gathering for movie night in the TV lounge or dropping by the beauty salon for a haircut. And coupled with our daily activities and outings, our residents never lack for having fun-filled days. When seniors join our community, they can say goodbye to life's responsibilities. Delicious meals are served three times a day in the community dining room. Housekeeping and linen services are handled by our staff, as is scheduled transportation for running errands or reaching doctor's appointments. And new services are always added to meet our residents' needs. At Aster Place it is our caring people who create a community which our residents are proud to call home.